And the healthy eats just keep coming! 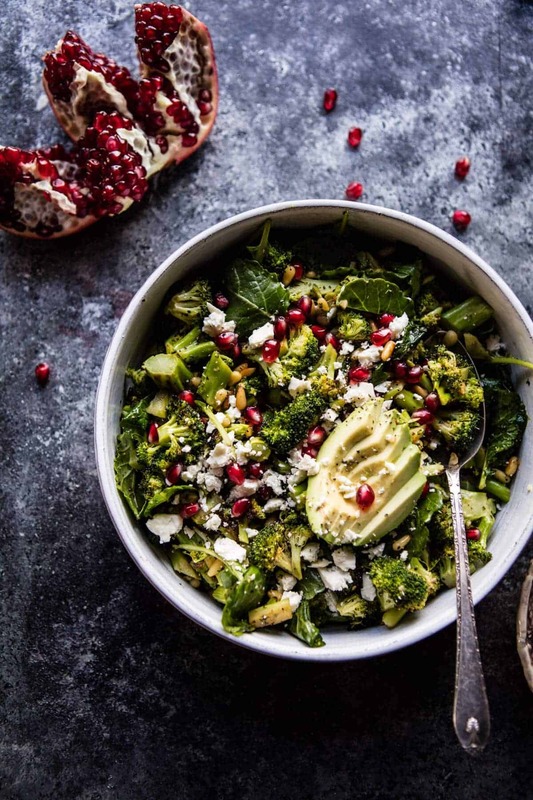 It takes broccoli to a whole new level with flavors like lemon, garlic, pomegranate and feta. It’s got texture, color and literally bursts in your mouth with flavor – love it! When I was thinking up recipes for this month, I steered clear of a lot of the typical salads because really, who needs yet another boring iceberg lettuce salad. I mean, right? When I think of salads I always think of them as a bowl full of veggies, maybe some grains, and most definitely some cheese. All about the cheese…obviously. I finished off the salad with a sprinkle of salty feta cheese and sliced avocado. At the moment my family is obsessed with both of these ingredients, but avocado especially. FUN/RANDOM FACT: Over the holidays I swear we must have gone through practically one hundred avocados. Ok, maybe not that many, but close. With of all the people at my parent’s house, plenty of avocados were being consumed. But the biggest consumer was my brother Red, who is on a HUGE avocado toast kick. I kid you not, he has been eating at least one, sometimes two, avocados a day. There were a few days that I literally made him avocado toast for breakfast, lunch and before-dinner snacks. He’s really into them so I figure I better keep serving him healthy food while he’s willing to eat it! This is the perfect salad to eat as a light meal, afternoon snack, side dish, or make it heartier by serving it with grilled chicken or fish. You could even add in some carbs like whole grain pasta, quinoa or brown rice. Either way, the salad is going to be great and hopefully become your new favorite. 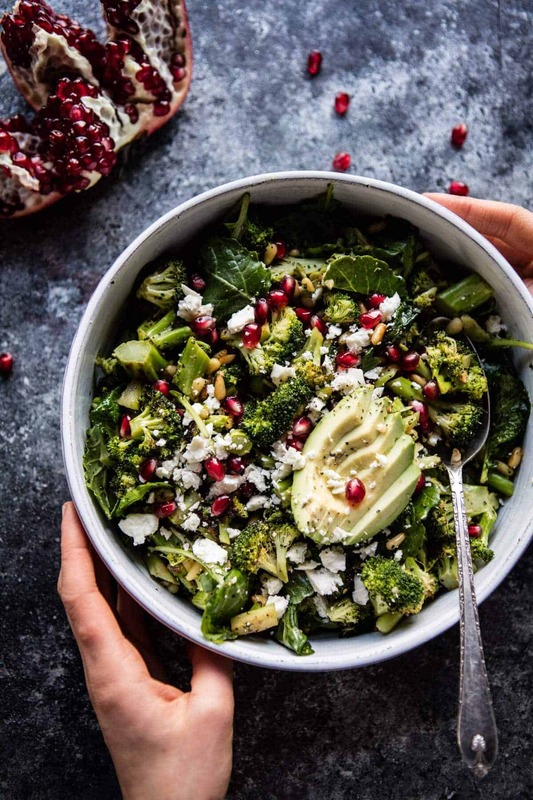 No more boring lunch salads, this January is all about the Broccoli Salad! Sidenote: how are you guys liking the Healthy January recipes? Are they getting you excited to cook up some healthy eats? 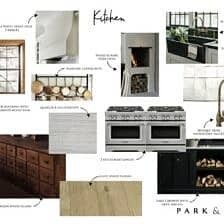 I’ve been looking over many of the suggestions for recipes you’ve given me. You will be seeing some of them later this month, but let me know if there’s anything you’re still craving. Maybe a winter comfort food you’d like to see healthified? 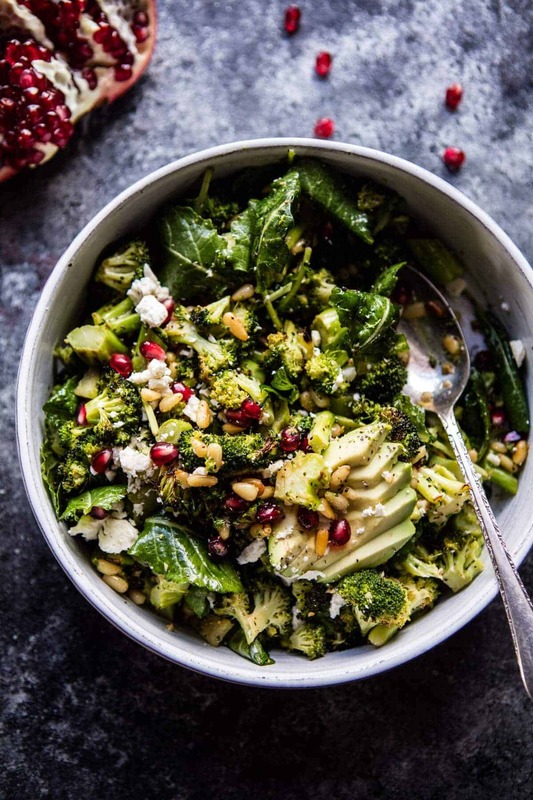 This salad takes broccoli to a whole new level with flavors like lemon, garlic, pomegranate and feta. On a large baking sheet, toss together the broccoli, pine nuts, 2 tablespoons olive oil, garlic, and a large pinch of both salt and pepper. Transfer to the oven and roast for 20-25 minutes or until the broccoli is just beginning to char. Remove from the oven and stir in the parsley. Meanwhile, make the dressing. 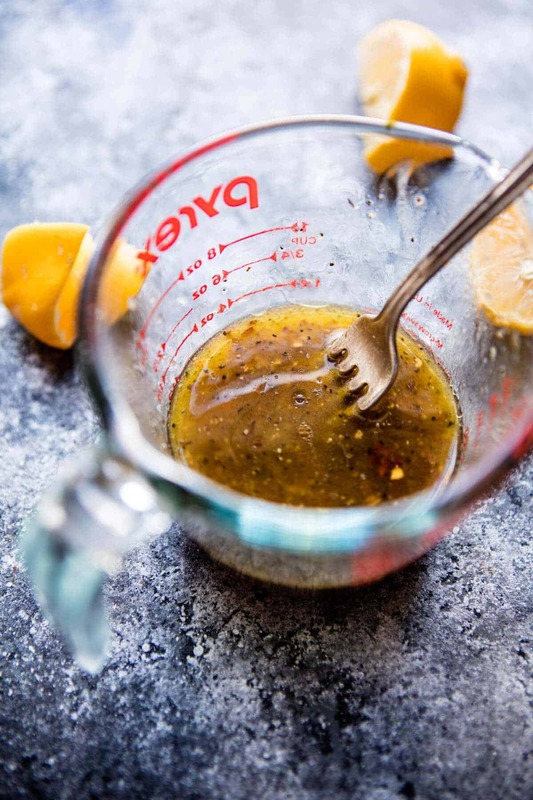 In a small bowl, whisk together the remaining 2 tablespoons olive oil, lemon juice, balsamic, and crushed red pepper flakes. Taste and season lightly with salt and pepper. Pour the dressing over the roasted broccoli. Add the baby kale and pomegranate arils. Gently toss to combine. Transfer the salad to a bowl and top with feta and sliced avocado. Eat! 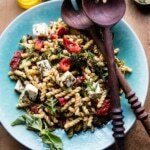 Greek Lemon Roasted Broccoli Pasta Salad. 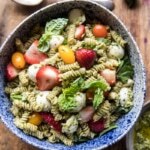 Strawberry Avocado Pesto Pasta Salad. This looks amazing, and definitely agree with you – this is exactly the kind of thing I love in a salad! Loving the Healthy January recipes and looking forward to seeing the rest of them! i always have broccoli on hand, so this sounds perfect for the days when i want something more interesting than just broccoli sauteed in garlic! This is my favorite recipe you’ve made this January! All of my favorite things in a bowl and simple to make-delish! Maybe some healthy breakfast recipes to throw in the mix? Omelets or some sort of egg scramble? Healthy afternoon snacks? Thanks for being open to all of these suggestions-can’t wait to see what you come up with! Breakfast ideas sound stellar! We eat lots of eggs. Want to get our own chickens. Advice anyone? Wow and it does sounds like you went through lots of advocados!!!!! Hey Tom!! Chickens are great, we love having them! I am so glad you like this one, Mollie! Thank you so much! & I will definitely take those into consideration!! Awh, sorry to hear that Ruth! Maybe try this with brussel sprouts instead of broccoli! I hope this helps! Need to eat this salad and many more salads for the new year but it’s a snow day for me and I have the ingredients for a big pot of soup. Need to go to the store for the salad ingredients. Soup is always a great idea on a snowy day! Thanks Nancy! Any reason to eat more broccoli is a good thing! It is so good for you! This sounds delicious. I also LOVE your soups! Soup is such the perfect meal especially in the Winter months. More soup recipes would be awesome! Thank you Tieghan! Thank you Kristen! I will try to fit more in! After all the naughty-ness I ate this Christmas – just looking at this makes my insides feel a little healthier and happier. Looks and sounds absolutely divine! Awesome! I hope you love this and other recipes! Thank you Natasha Ann! Thank you so much Julia! I ma glad you are enjoying this one! 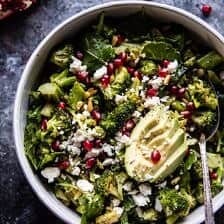 This broccoli salad looks amazing and I plan to try it! Curious about your avocado toast — what do you put on it — anything other than avocado? I’ve tried it with sprouts and sliced tomatoes and it was very good. Hey Donna! I also do a different combo, but for my brother I have just been doing whole grain toast, avocado, flaky sea salt and lemon. I get crazy with my combos and add sprouts, feta cheese, all kinds of things! Yay! I hope you love this! Thank you Gabriella! This looks so simple and perfect! I will be making it with some farro and maybe some grilled shrimp for dinner this week! I’m looking for more smoothie recipes that contain very little sugar. Sounds so good! I hope you love it Cassandra! Thank you! Haha that is so great! I hope you love it, Karlie! Thanks! I hope you love this one, Caroline!! Thank you so much! 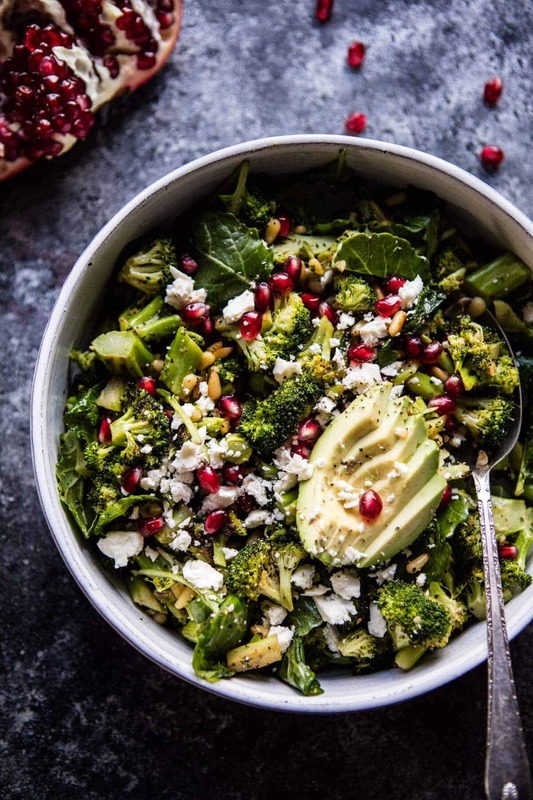 Love broccoli and this salad! I would love to see a healthy macaroni and cheese or fettuccini alfredo!! Ooo two great ideas! Thank you Kristen! Made your Mean Green Detox Veggie soup and LOVED it!! Can’t wait to try this recipe. Thanks for making January taste so good! I am so happy you are liking healthy January so far!! Thank you Tracy! This looks amazing! Loving your healthy January recipes. I’ve bookmarked almost all of them 🙂 I would love to see something with butternut squash since it’s the BEST right now! when do the pine nuts get added to the oven? i wasn’t sure to add them for the full roasting time or partial way through…don’t want to end up with burnt pine nuts. definitely making this as i have quite a bit of broccoli leftover & we LOVE it roasted! thanks for all the healthy recipes…definitely needed this time of year!!! I honestly love broccoli salad so this is right up my alley! I can’t think of a yummier way to eat some veggies! Yay! SO glad you’re loving this salad, Tori!! Thank you! This sounds dreamy, I love broccoli salads! Yes, PLEASE keep the healthy recipes coming! Would also love some make-ahead lunches and breakfast ideas for the kiddos (lunches that don’t have to be heated). 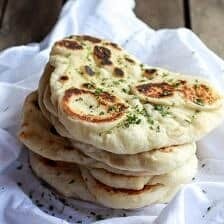 Your recipes and photos are simply the BEST!! Awesome ideas! Thank you Leah! LOVE LOVE LOVE this salad! Such a nice switch up to the usual salad! And yes to more healthy recipes PLEASE! Glad you’re loving it Amanda! Thank you!! 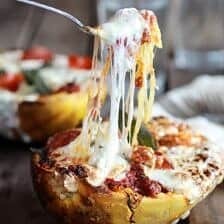 I think I will make this for dinner tonight! Looks delicious!! Okay awesome! Thank you Sarah! I hope you love this salad! This looks soooooo so good. 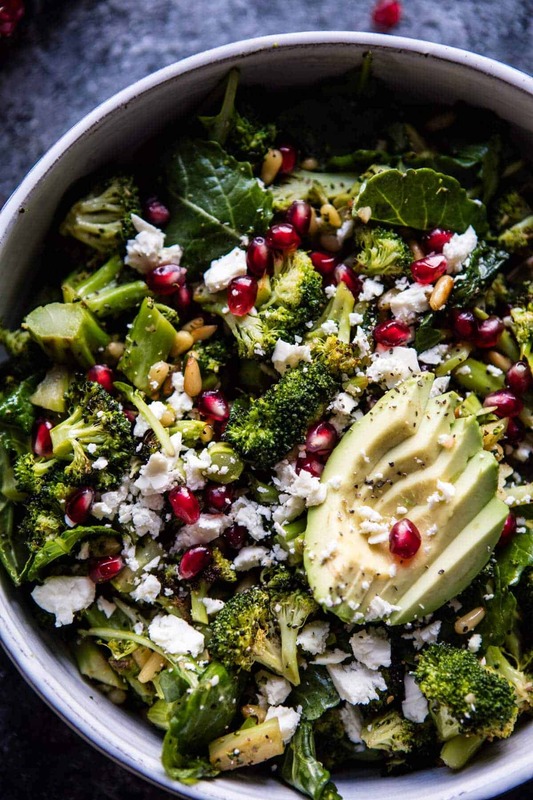 I eat roasted broccoli on the regular so I can’t wait to try this salad! Sounds like great ideas! Thank you Sara!! This is the salad I didn’t know I was dreaming of. It contains ALL of my ideal salad ingredients. You really knocked it out of the park on this one. So glad you like this one! Thank you Libby!! Say no to boring salads should be 2017 slogan and this one hits all the marks. Awh thanks so much Nicole! And you know what they say: healthy doesn’t have to be boring, and neither do salads! 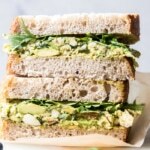 I would love to see more of these recipes on your blog! Yum! 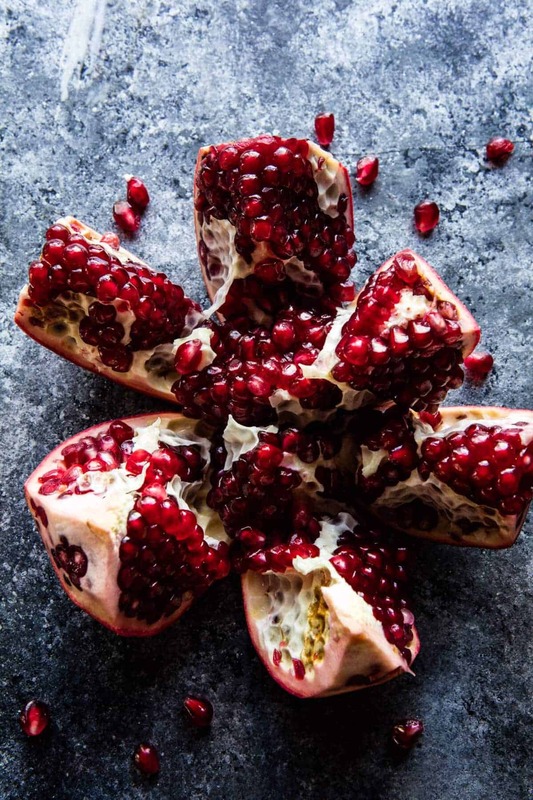 I love the addition of the pomegranate seeds! You know me and my pomegranate seeds! Haha. Thanks Kari! 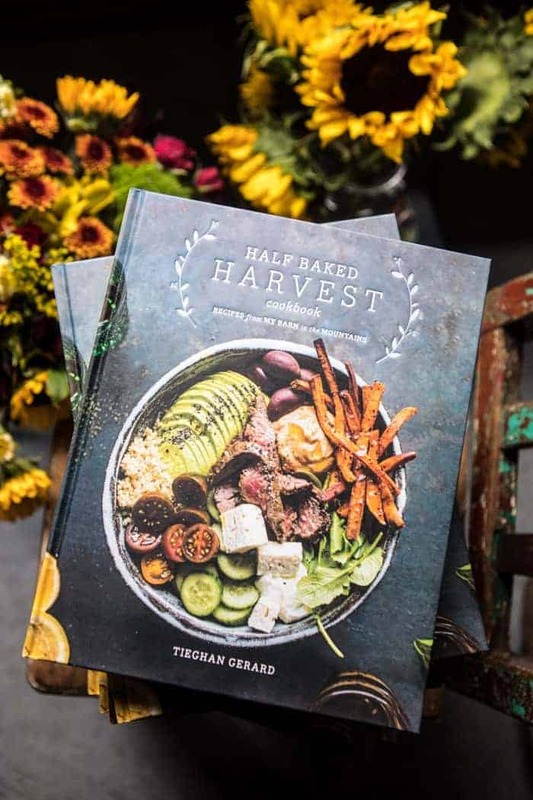 I LOVE seeing the healthy recipes from HBH, it’s such an inspiration! Keep ’em comin’, girl! Theres going to be a lot of them this month! So happy you are liking them! That looks awesome! I will have to try it!! 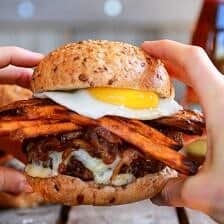 I really love the healthy recipes, but I think your idea about comfort food made healthy would be awesome. It is sooo coooooold where I live right now, and the thought of eating lighter fish and veggie bowls (which to me are awesome in the spring and summer!) just makes me shiver even more! I would love to see healthy recipes that are heartier and warm you up! Ah yay, so happy to hear you like the ideas of healthy recipes! SO happy your liking this and everything else! Thanks Laura! Oh my.. this looks so good and healthy! I love broccoli salads! So happy you like it Laurie! Thank you! Can’t even begin to say how awesome this looks!! In love! Except I am allergic to tree nuts so I’m thinking of roasting some pumpkin seeds with the broccoli instead? Also, I love the idea of adding a long grain wild rice or whole wheat bow tie pasta, or maybe quinoa? I think pumpkin seeds would be amazing! Great idea! 🙂 Quinoa, rice or pasta would all be awesome! I love salads and am slightly embarrassed to admit that I’ve never tried a broccoli salad (hangs head in shame). This might be the recipe I’ve been waiting for! Thanks and Happy New Year! I hope you love it, thank you Mia! Delicious! Added farro and served warm. Boyfriend approved! Thanks for the great recipe. Made this recipe tonight and my girlfriend and I both LOVED it! It is so flavorful and filling. We omitted parsley (didn’t have any) and swapped pine nuts for toasted almond slivers. Also added a balsamic marinated chicken breast to make it more of an entrée. Super easy to make after a crazy work day. ?????? Sounds so awesome! I am so glad you loved it Sandy! Thank you! I like roasted garlic but never thought of it in a starring role in a salad…nice! This was delicious. My husband doesn’t even like broccoli but he absolutely loved this! I love that your dishes are always delicious, aesthetically pleasing, and relatively healthy and easy to prepare! Keep up the amazing work and always looking forward to what you have in store for us! I am so glad you both enjoyed this Kristine!! Thank you! So happy you liked it, thanks Julie! Made this yesterday and really enjoyed it! I used dried cranberries instead of pomegranate and it was excellent. Good at room temp the next day, which is always a challenge I have with veggie dishes. Thank you for the recipe! Sounds delish Claire! Thanks so much for making it! Is this recipe to be served cold or hot? Either would be great, but I personally like it hot. Let me know if you have questions and I hope you love this! According to a scientific studies, olive oils favor a greater absorption of the beneficial compounds of the vegetables. The extra virgin olive oil is always the best choice for the dishes. Thank you for sharing! So cool! Love cooking with olive oil! Thank you for this beautiful website!! I just discovered you Sunday and I’ve already made two of your recipes. I am using an app to track my meals, it has a good number of your recipes, but not all. Is there a way I can get the nutritional info? Many thanks! Hi Stephanie! I am so glad you are enjoying my recipes!! Unfortunately I do not like to provide nutritional info for my recipes. So sorry. Let me know if you have any other questions. Thanks again! 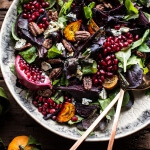 I loved the flavors of this salad! The only change I would make is to roast the pine nuts for two minutes until golden brown. I tried to roast them together with the broccoli for 20-25 minutes but they were smoking up my kitchen so I had to take them out of the oven. I am so happy you liked this Erin! Thank you! Thank you so much Lynn! I hope you love this! 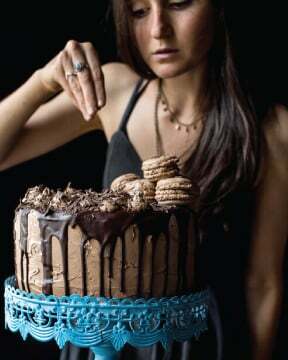 I bought the cookbook at Anthropologie and have not been able to put it down. We have tried at least 5 of the recipes over the past two weeks and each is better than the last. My new go-to for recipes. Seriously so good! I’m always trying to get my family to try new combinations and experiment with food they thought they disliked. Huge hit on Christmas Eve at our house. Definitely will be making again. Thank you so much Kaitlyn!! I am so happy you like my book and also some recipes on my blog! I made this for a man who only eats broccoli and he LOVED it! It was an impressive dish and super easy. Keep em’ coming! That is so amazing! Thank you Georgia! I’ve just discovered your blog and love it. This salad was delicious! Quick and easy, waem and comforting, with flavours that really pop. It’s not letting me rate the recipe, but it’s 5 star for sure. Hi, Can’t wait to make this recipe, looks so tasty. Could this be all prepped the day before and just add the dressing before serving? Hi! I just made this and realized I never used the garlic that I sat out as one of my ingredients… I don’t see a spot in the recipe instructions for when to use it. Could you please let me know if I missed something? Thanks. Love ypur recipes. About the Kale. Do we just toss the fresh kale? Ir do we hace to do anythibg to it? This looks incredible and I could certainly use some more greens in my diet after the holidays 🙈 looking forward to making this during the week! Thank you Michelle! I hope you love this! We tried this salad recipe tonight. It was incredible! The only change I made was I used almonds instead of pine nuts. It was absolutely incredible and all the flavors combined so nicely. I am so happy to hear that Lauren! Thank you! A new staple in my kitchen! I added grilled chicken to make it a main, but it’s so easy and DELICIOUS on its own.